Can you confirm these amateur observations of Plestiodon lynxe? lynxe: Hidalgo, Veracruz, San Luis Potosí, Puebla. Type locality: “specimena nostra prope chico invenit Deppe”. Very probably from El Chico (or Mineral El Chico) near Pachuca, Hidalgo, to where SMITH & TAYLOR 1950 restricted the type locality. Also given as Chioco, Mexico. bellii: Mexico (Durango, Zacatecas);Type locality: originally not given; restricted to “15 miles east of Poza Rica, Veracruz” by SMITH & ETHERIDGE 1953. Types Syntype: ZMB 1271, collected F. Deppe. Whereabouts of the juvenile syntype unknown (see Bauer et al., 2003). Comment Distribution: (Probably erroneously) reported from Guerrero, Guanajuato, and Michoacán (fide SMITH & TAYLOR 1950). Subspecies: SMITH & TAYLOR 1950 also list Eumeces furcirostris COPE 1885: 169 as subspecies of E. lynxe, which is not listed as such by LINER 1994. 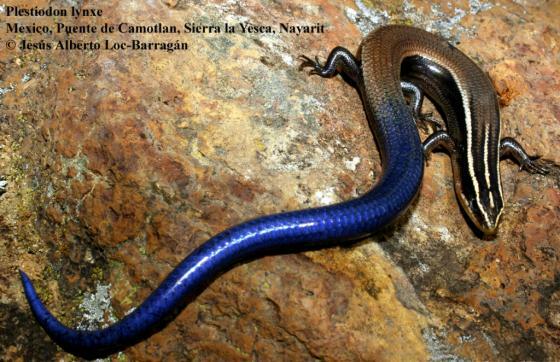 Type species: Plestiodon quinquelineatum DUMÉRIL & BIBRON 1839: 707) is the type species of the genus Plestiodon DUMÉRIL & BIBRON 1839 (fide McCranie 2018: 365). Etymology The generic name Plestiodon is derived from the Greek words pleos (full, full of) and odous (tooth). The name apparently alludes to the numerous teeth of these lizards. The specific name lynxe is derived from a Greek word for "wildcat," perhaps in reference to its quick, catlike movements (Lemos-Espinal & Dixon 2013).